James McNeill Whistler was down on his luck in 1879 when a sympathetic gallery owner sent him to Venice to make a dozen etchings. Finding that the watery reflections and atmospheric light suited his loose treatment of form, Whistler stayed for more than a year and produced some fifty prints. Nocturne: Palaces is among the most poetic. 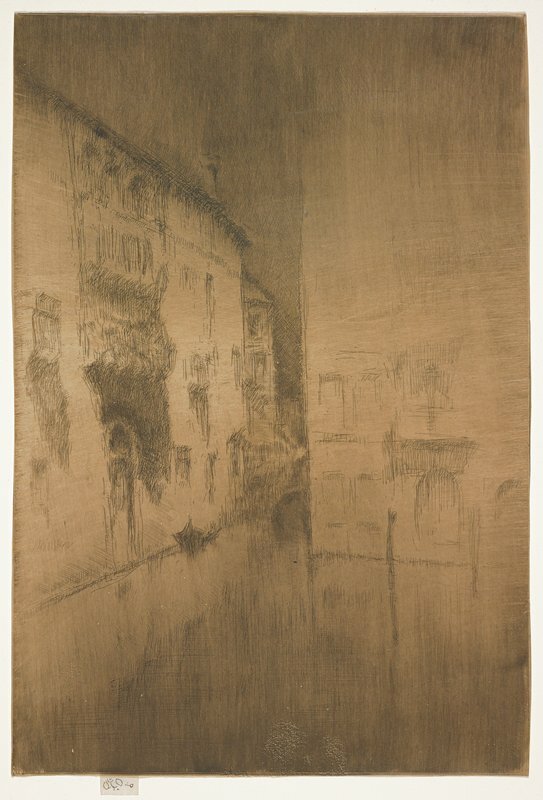 The term “nocturne” underscored Whistler’s intention to create “artistic arrangements” rather than topographical views. Indeed, scholars have been unable to locate this site, which may have existed primarily in the artist’s imagination. Whistler liked to fuss with his printing plates. At least six years and ten stages of alteration came between this impression and an earlier proof (Mia 2014.117.3). Perhaps it was his now distant memory of Venice that caused him to mute the light in the present impression. He achieved this softer effect by using a chocolaty brown ink on a copper plate whose drypoint lines had become somewhat worn and by printing on warm-toned Asian paper. William M. Ladd, Portland, Ore., sold to Jones; Herschel V. Jones, Minneapolis; given to MIA, 1916.